My experiment with mealworm cultivation is progressing. When I last reported, a month ago, I had acquired some larvae and they were busy squirming around eating bran and bits of fruit and veg. When the supply of bran that came with them was used up, I started to give them oats, as these were readily available. Next time we visit our local mill, however, we’ll buy some bran since they tend to have lots of it (left over from making white flour). Anyway, after about 10 days, some of the larvae started to pupate and, as suggested in the instructions that came with them, I transferred these to a separate container. My tool of choice was a teaspoon, as this seemed the gentlest approach. It then wasn’t many days more before beetles started to emerge: they are very pale at first, gradually turning brown and finally becoming almost black. My instructions said that I should move the adult beetles to a third container to allow them to mature, breed and lay eggs. I started doing this (again, careful transfer with a teaspoon), but realised after a week of making these transfers every day that this was simply not a good use of my time. If I can’t cultivate mealworms with relatively low input, I don’t think I should bother. So, I visited the internet and discovered lots and lots of descriptions about how to raise mealworms. 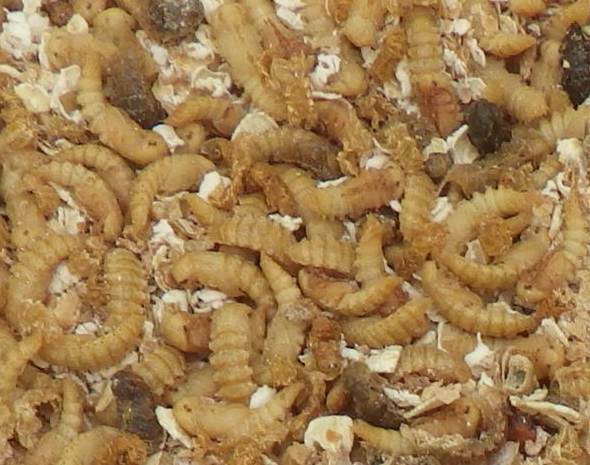 Opinions seem to differ greatly about the approach to use, but in the end I decided that I would follow the advice on BackyardChickens.com entitled ‘How to raise mealworms‘. Basically, it says, put them in a big dry container with appropriate food (bran/oats/chicken feed and fruit/veg for moisture) and let them get on with it. When you want to harvest some of the larvae to feed to your hens, put some slices of potato in, leave for ten minutes then remove and there will be mealworms attached to the undersides taking in moisture… shake them off and give them to your hens. Now, this sounds like a system that I can manage. So, with a new layer of oats (I still haven’t got the bran yet) and gay abandon I have put all the life-stages back together in a large tub-trug in the greenhouse. Apparently, its more important that they have a large surface area than depth, so I hope this will be suitable. In addition, air circulation is vital. As a result, I’m not covering them up at the moment, although I will put mesh over them to keep the birds off when I need to take them out of the greenhouse. I should be able to keep them out of the house for much of the year, although they won’t withstand frost, so they may have to be inside in the winter. I sincerely hope that the chickens appreciate all this effort and research! They are ever so expensive to buy, but the chickies LOVE them, so I’m really hoping this will work. Great idea… very permaculture: minimum input for maximum output! I think they’re bugs and the simple approach is the best. Go with Narf’s idea. If they have enough food they’ll breed and multiply. So long as you have a few spares you can experiment to your scientific heart’s content about what makes them happy! But I demand photos of the squawk-fest that will ensue when the Girls get their first treat! I will set the camera up on a tripod for the fun and games… at least I will when I have a big enough population! I had no idea that chickens were that complicated. I shall read and learn. All you have to do to politicize a party in our little city is loudly say “Chicken!” Antiquated zoning codes forbid raising them for most of us. It was a big issue in our last mayoral election. “Pro-Chicken” bumper stickers abound. The anti-chicken party doesn’t have stickers; they just phone the enforcement office and badger them into ticketing anyone with illegal birds. 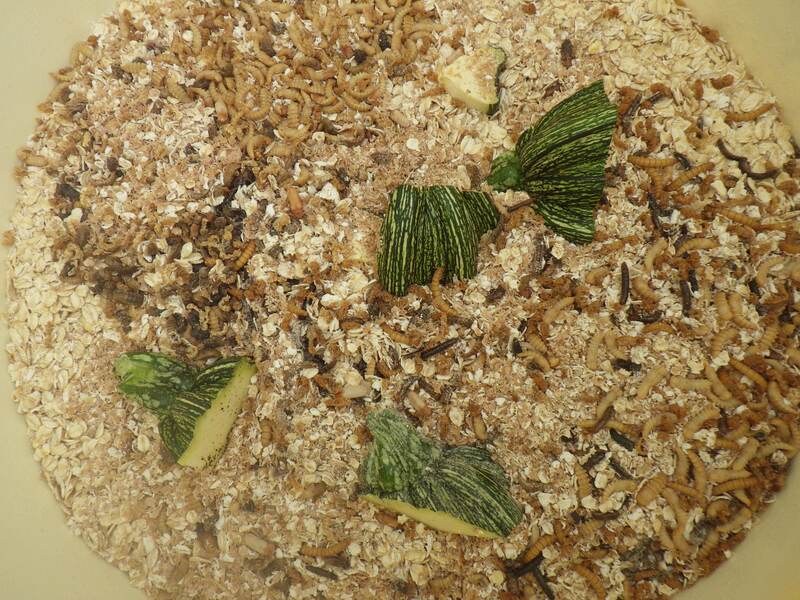 I laughed reading your post as I realized I could grow mealworms without a challenge … just call it research or a hobby! A mealworm farm! I wonder whether the anti-chicken lobby would prefer that. I am incredibly thankful to live in the UK where we just do not have zoning laws. Wow, you are loyal to sustainable living. I would not be good with the meal worms. We too have zoning regulations. Fortunately, many of our friends have extra eggs. One of the joys of living in the UK is that there is no zoning as you have it in the US!